I like the graphic design quality of this shot. 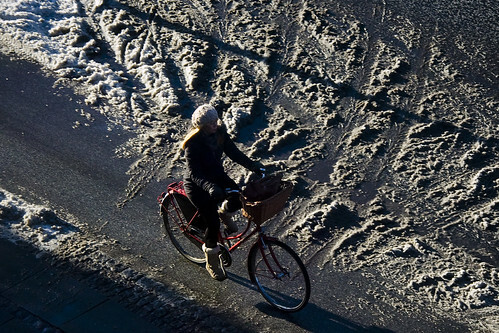 Late afternoon sunlight, frozen snow tracks, calm and collected Copenhagener on a bicycle. This blog has made me want a bicycle!!!Gorgeous! I have the bicycle--this site makes me want a bicycle! Oh, and I wouldn't mind looking that classy on a bike! Nothing beats the poetry of sinuous bike tracks weaving in an out of each other in fresh-fallen snow. I should try catching that sometime, myself! I´m more amazed at findind an actual stretch of clear bike path in Copenhagen today - I crossed town twice today, and the roads were worse on the late trip. No clearing of small bike-preferred roads at all!